Rachel: These sequels don’t know when to stop. Fifteen years after director, Wes Craven, and original writer, Kevin Williamson, scared the crap out of unsuspecting moviegoers initially, they have finally reunited to resurrect the SCREAM franchise. Original cast members, Neve Campbell, Courtney Cox and David Arquette have returned for SCREAM 4 as well and are joined by fresh faces, Emma Roberts and Hayden Panettiere, to name just a couple. With all this pedigree to back it up, this sequel / reboot / remake has a lot to lose and expectations going in will not be high considering how disappointing the third installment was. This might work to their advantage though because no one will ever expect SCREAM 4 to be anywhere near as good as it actually is. There is no real need to divulge too much plot here; the element of surprise is key as you well know. I will say though that, a decade later, good old tortured Sidney Prescott (Campbell) – who for some reason still answers her phone – has finally turned her life around and published a book about no longer being a victim. Her promo tour finds her back in her hometown of Woodsboro, just in time for the anniversary of the original massacre. And you know Ghostface is not going to just let an anniversary go by without slicing up a few more fast-talking, movie-loving teenagers. The return to Ghostface’s home turf is certainly a welcome one. Not only does it allow for plenty of bloody nostalgia but it also removes the focus from the “Stab” film series, a film-within-a-film device that was taking all the serrated edge out of the actual series. Besides, all of Williamson’s delicious nods and winks to the original make SCREAM 4 an actual film within another, without obviously trying so hard. Perhaps the most impressive thing about SCREAM 4 is that it actually exists. Craven began shooting on SCREAM 4 without a finished script because Williamson and producer, Bob Weinstein, couldn’t agree on some of the major plot elements. Before they were able to come to any conclusive agreement, Williamson had to return to honour his contract as a story developer on TV’s The Vampire Diaries. SCREAM 3 screenwriter, Ehran Kruger, was called in to smooth over the rough edges in Williamson’s script and even in the weeks approaching the release of the new film, Williamson had yet to even see the finished version. Still, all parties involved insist that the drama in no way took away from their support for the project. After all, SCREAM made Williamson a hot commodity, reinvigorated Craven’s career and put Miramax on the map. The SCREAM series has always been about the rules, from honouring them to completely circumventing them. They now have an even bigger challenge – to reinvent the rules. Society has gotten a lot more violent and a lot more digital in the last decade and SCREAM has to keep up with the times. 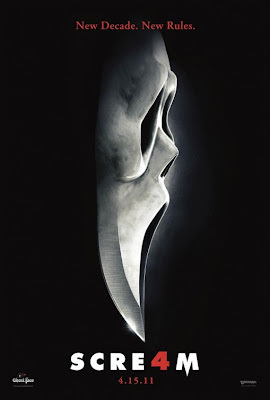 By incorporating more modern elements like video streaming and cyber-stalking into Ghostface’s bag of tricks, SCREAM 4 feels relevant and revitalized, like it needed to be made. How’s that for a new rule then? A successful horror franchise should only come back if there is actually fresh blood to be drawn instead of just to bleed it dry. Fortunately for SCREAM fans everywhere, the crimson corn syrup continues to flow freely from Ghostface’s blade. Hey inMovies. I definitely agree that I would not have had any interest in this if they did not bring the original cast members back. I enjoyed the new additions but would not have cared if it was just them. It’s a shame the film wasn’t able to find new fans.